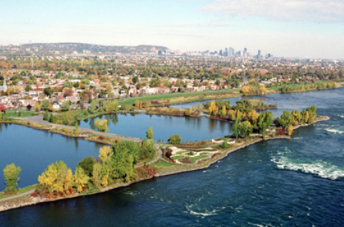 LaSalle is located on the southwest area of Montreal and runs along the shore of the Saint Lawrence River. LaSalle is a relaxed community, which offers a great choice of housing solutions, such as condos, and residential neighbourhoods to suit different tastes. Residents in LaSalle are able find all the services they need close to home, and are just minutes away from downtown Montreal. They enjoy quick access to the Mercier Bridge, Highways 20 and 15, as well as the Angrignon bus terminal. In addition, LaSalle is in close proximity to the charm of Old Lachine’s many boutiques and restaurants including the Carrefour Angrignon shopping mall. Moreover, LaSalle residents have access to a variety of parks, schools, daycares, swimming pools, water activities, arenas, sport and community centres; hospital and CLSC offer a safe and convenient place to raise a family. It is a very tranquil little island. This park is ideal for those who want to escape from the hustle and bustle of urban life for a moment. People are able to enjoy the magnificent view of river and its rapids; they can discover rare species of birds or stroll along the many carefully maintained trails. This is the largest western entertainment venue of the island of Montreal. It offers a program of sixty performances including songs, theatres, comedies, dances, music, variety and family shows. A Cultural and Community Centre that works to promote social, intercultural and intergenerational integration through culture and the arts. The Aquadome offers the community of LaSalle and the surrounding areas the opportunity to benefit from the wonderful facilities under one roof: a 50-metre swimming pool divided into two 25-metre basins, a leisure pool with water jets, slides for young and old, and a hot tub area. LaSalle offers its residents cultural entertainment and, just like Montreal’s other neighbourhoods, has a solid infrastructure that meets the needs of its community, and offers a wide range of housing options, including new condo developments.